Every single one of our soap products, both bar soap and liquids (hand wash, body wash and bubble bath) are considered naturally-based and all bar two are organic. The National Ingredient Resource Center (NIRC) considers a product “all-natural,” if it contains at least 95% of ingredients that fits their criteria for natural ingredients. The other 5% may come from ingredients that do not meet their criteria for natural, but do not contain synthetic fragrances, artificial colours, or harmful fillers.  Little Soap Company uses mostly natural and/or organic ingredients. Sometimes it is necessary to use a non-toxic synthetic ingredient (s) when no equivalent can be found in nature. While the idea of using 100% all natural products may seem appealing, it is not practical and does not necessarily mean they are safe. In fact, failure to include effective preservatives in a product can lead to health problems, such as skin infection. It is necessary to use some type of synthetic non-toxic preservative(s) to ensure the products you use are safe. The recent negative publicity surrounding the use of parabens may give the impression that all synthetic preservatives are toxic or carcinogenic, when in fact, they are not. In an ideal world, we’d be able to pluck the leaves or seeds from a plant or tree, crush it up and mix into our products and come up with a safe and effective preservative. In reality, this is not feasible. Some natural preservatives are originally plant derived, but must undergo a chemical process to convert them into a viable and effective compound strong enough to prevent and combat bacteria and fungus. A balance must be struck between effectiveness and gentleness – in other words, a preservative, which is not only non-toxic, but one that won’t cause skin irritations or allergic reactions. There are many synthetic ingredients that are considered to be safe and non-toxic. Conversely, there are all-natural ingredients, which can be considered toxic, and you wouldn’t want to use. From our perspective and in our research, it is more important for a product to be safe and non-toxic rather than a 100% all-natural and organic. With that in mind, here is how our products fair in relation to that – pretty amazing facts really! ALL of our products are Vegan and registered by The Vegan Society. ALL of our products are cruelty free. We are currently being audited (May 2018) by Leaping Bunny Cruelty Free so we can display their logo too. There is no soap or cosmetic product in this world that is truly “allergy-free”. Although our products are made with all natural ingredients, many people are allergic to natural ingredients such as certain plants, nuts, and essential oils. An ingredient that is very mild and soothing for one person can be an allergen for another! Some of our soaps have no essential oil added – the natural aroma is simply the oils used to create the recipe. Some bars have distinct natural aromas due to honey, oats, poppy seeds or herbs. People with severe allergies–please note: If you have severe anaphylactic type reactions to ANY of the ingredients we use please do not buy our products. We cannot guarantee that one soap or product has not touched another. We often receive phone calls and emails from customers with questions about products made with tree nuts. Tree nut allergy is one of the most common allergies that can cause a severe, potentially fatal, allergic reaction called anaphylaxis. A person with an allergy to one type of tree nut has a higher chance of being allergic to other types. We list every ingredient in all of our products on the website and of course on all packaging, so reading the ingredient list will help in eliminating ingredients that may cause problems. Shea Butter: The Food Allergy Research and Resource Program reports the Shea nuts are a tree nut, but that they do not belong in the list of commonly allergenic tree nuts. Our products (bar soaps) that contain Shea Butter are all classed as wash off, not leave on and the actual percentage of oil is negligible per wash. It is the actual oil from the Shea nut that is used that contains the protein which is what triggers the allergic reaction. The risk of a reaction to the Shea Butter is considered to be extremely low to those who do have a nut allergy. Most people with nut allergies do not have a problem using Shea Butter, but it should be noted for those with extreme cases. Coconut Oil: Coconut is not a botanical nut; it is classified as a fruit, even though the Food and Drug Administration recognizes coconut as a tree nut. While allergic reactions to coconut have been documented, most people who are allergic to tree nuts can safely eat and use coconut oil on their skin.